HomeEdiblesWhy Is the High from Edibles So Different? Why does it feel as if you get a more intense high from edibles? Part of it is you can’t mediate the dosage in the same way you can with smoking or vaping, but there’s something else going on, too. The main psychoactive chemical in marijuana is Delta-9 tetrahydrocannabinol (THC). This is the chemical most responsible for the marijuana high. It interacts with your body’s endocannabinoid system, a group of naturally produced neurotransmitters and the receptors on nerve cells into which the molecules fit, like keys in locks. THC mimics the body’s natural cannabinoids and fits into your cannabinoid receptors. When these receptors are activated, it leads to a cascade of important physiological processes that govern mood, appetite, sleep, memory and a host of other functions. THC and the other cannabinoids in marijuana activate these receptors, but only partially, meaning THC is a “partial agonist” of the cannabinoid receptors. But the cannabinoid molecule is complex and poorly understood. 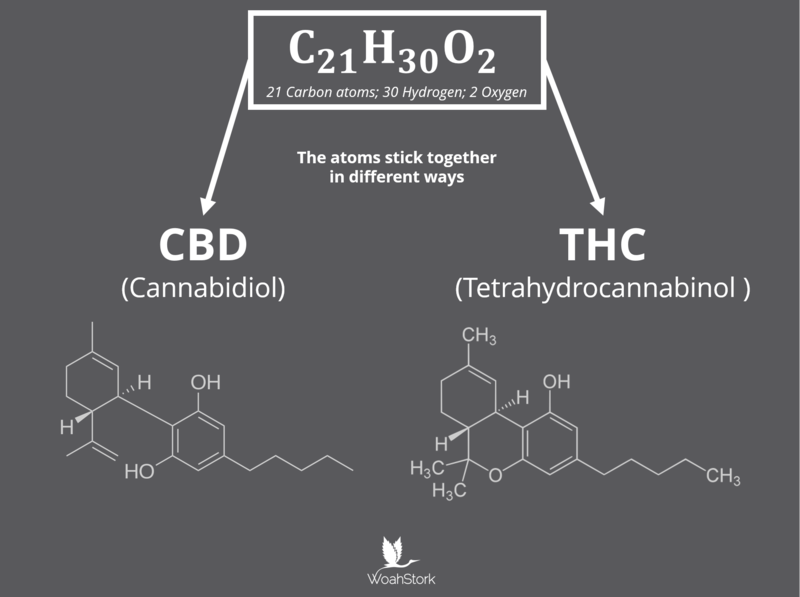 For instance, the other most potent cannabinoid in pot, cannabidiol (CBD), is an isomer of THC, meaning it has all the same atoms, but they’re arranged differently. This simple re-arrangement of atoms means the two chemicals have wildly different and sometimes opposite effects. Also, THC and CBD as they occur in the marijuana plant are in acid form, which makes them incapable of reacting with the human nervous system in a meaningful way. Heat must be applied to remove the carbon and oxygen atoms attached to the THC or CBD to make them “bioavailable” to your nervous system. It’s why you have to smoke or bake weed to make it effective– a process known as decarboxylation. The reason the high you get when you eat marijuana is so much more intense has to do with how your body processes the THC. When you smoke, the Delta-9 THC enters your lungs and immediately transfers to the bloodstream, where it is carried to nerve cells. 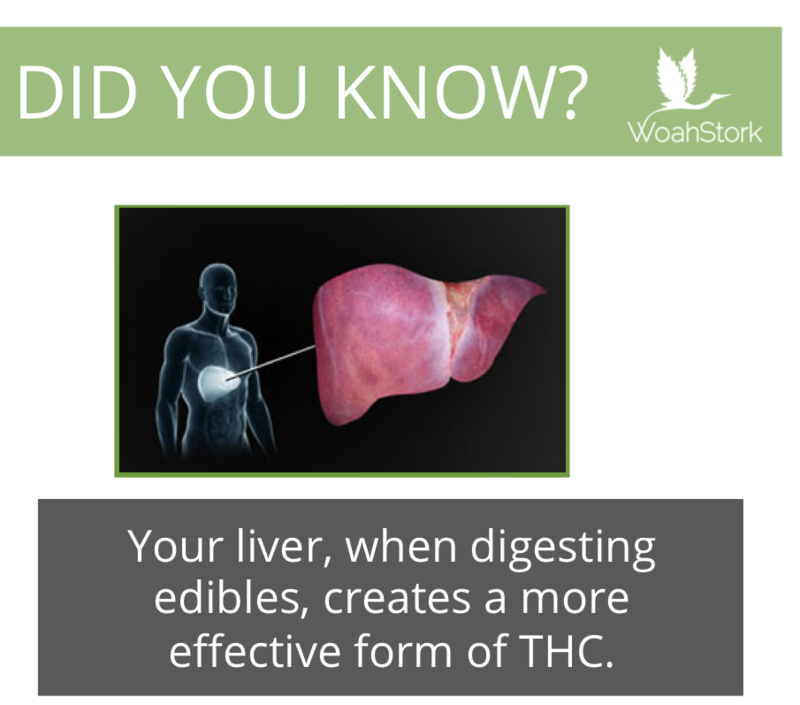 When you eat cannabis edibles, however, your digestive system breaks down the THC molecule, running it through your liver to filter it out like any other toxin. The high from edibles like this Defonce Chocolate Bar can be drastically different. It’s always advised to start with 5mg and then wait 2 hours before trying any more. The way your liver breaks down THC is, in part, to add hydrogen and oxygen atoms. This is one step in the process of metabolizing pot, but the result is to create 11-OH-THC, or eleven hydroxy THC, which is a more potent cannabinoid than Delta-9 THC. So, with this extra hydroxy group (a fancy term for hydrogen and oxygen atoms), THC becomes a more effective agonist to your body’s cannabinoid receptors. The difference between a smoke high and an edible high hasn’t been a specific subject of scientific research, but doctors have looked at the process by which your body metabolizes marijuana. Most of what we know about the high from edibles comes from this research. Scientists have examined stool samples and blood concentrations of THC in all its various forms to do a kind of forensic analysis of how you process and break down the chemicals in smoked marijuana. Researchers examined stool samples of people who ingested marijuana to figure out how they break down and excrete the chemicals from the drug. In studying the “metabolites” of THC in poop, doctors have been able to reverse-engineer the process by which your liver breaks down THC, leading to discoveries about 11-OH-THC. Looking to try edibles? Check out this easy recipe for cannabis-infused oil, which can be used to create a plethora of different edibles. 11-Hydroxy THC that explains the effect of edibles?